Check out the ebooks below. Choose any 2 from here and get the 3rd ebook of your choice FREE! After payment is made, please click on the link to Return to Website to complete the process. We will email you the free ebook of your choice after receipt of confirmation of payment. We will process your request within 2 days. Transactions made on weekends will be processed the next working day. Thank you. If you experience any problems, please email assistant@donna-stone.com.au. These days with often tight budgets, and even tighter profits, we have to operate our business at top efficiency. 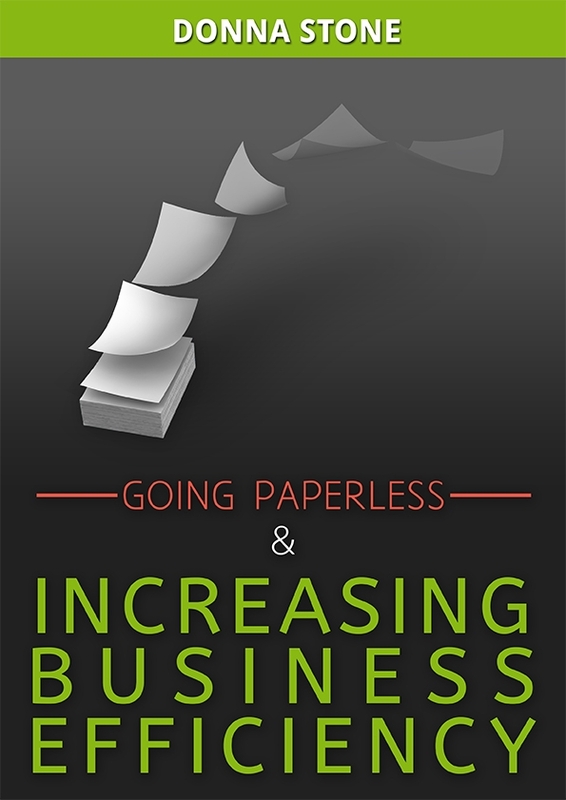 Operating a semi paperless and efficient business and office will improve your bottomline in many ways, by saving costs on product and time. Here are over 50 tips, most of which can be implemented in many businesses. From 30 years of assisting Australian businesses and my experience in running a Private Employment Agency for 3 years, I’ve given you the basics on how to recruit and retain great staff. 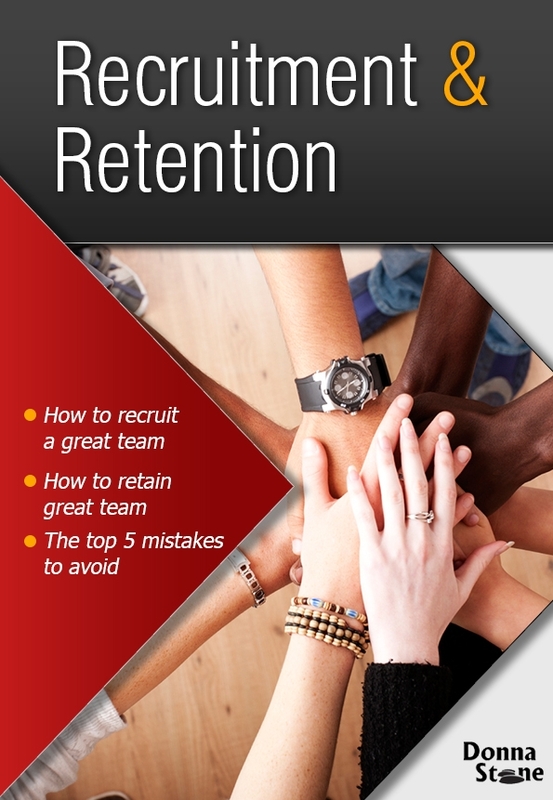 You’ll learn the Top 5 critical mistakes people make, How to successfully recruit a new team member, and Great tips to retaining a great team member. Business Planning is not just about goal setting. 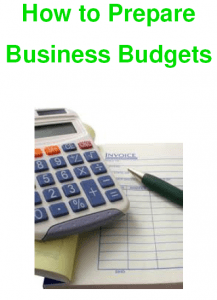 One very important business plan is budgeting. Many business owners hate that word, so I often call it “Planning for Profit”. Sounds nicer doesn’t it! Whatever you call it, having a plan and sticking to it will keep your business (and finances) on target. 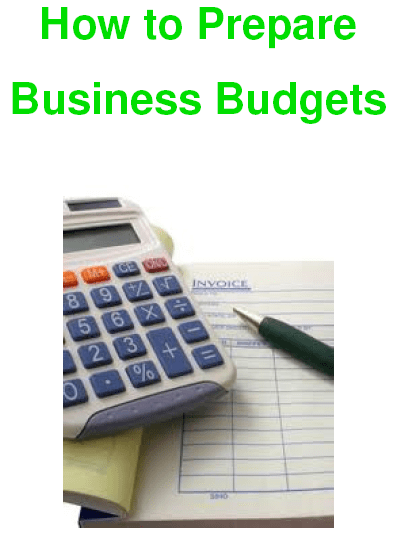 In this ebook I discuss budgets in general and how to create one and then specifically have you insert a budget into MYOB. Regardless of what program you are using you will get useful insight from this ebook. 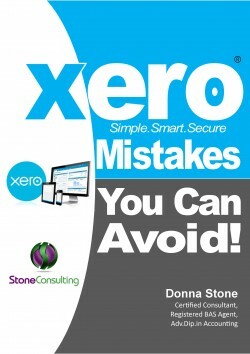 This e-book is suitable for Australian based businesses and the tips relate to current (April 2014) tax rules around bookkeeping. Great tips for asset coding, backups, budgets, deposit handling, GST, inventory, links, defaults & setups and so much more. From a bookkeeping expert with 30 years experience. Money makes the world go around, and although it’s not as critical as oxygen, it is definitely up there as far as importance goes. 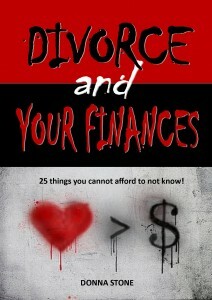 This ebook will give you 11 fantastic tips that include saving, getting paid, scams, budgeting and much more. 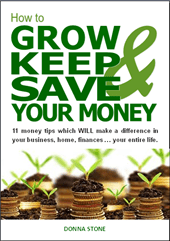 We can’t live without money so we should learn what it is we can do to grow, keep and save our money. Divorce can be very messy and will affect so many aspects of your life, such as your happiness, security, home, family, children and finances. This ebook will provide for you 25 tips that will help you to effectively deal with the situation and come away in a reasonably good financial position and position in life. Get through the experience as in tact as possible. This e-book is suitable for Australian based businesses and the tips relate to current (February 2014) tax rules around MYOB and bookkeeping. Great tips for asset coding, deposit handling, GST, superannuation and so much more. 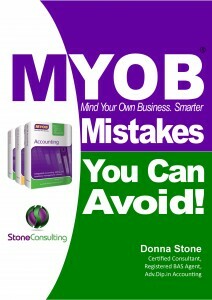 From a bookkeeping expert with 30 years’ experience and 20 years on MYOB as a MYOB Consultant (now Certified) learn some great tips of the trade. 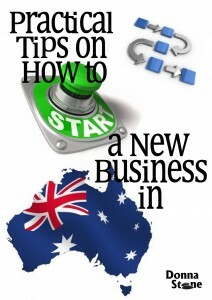 Having a guide on how to start a new business in Australia is very valuable. The lists are pretty much very basic whatever business you want to get into. Some of you may not know anything about this but some of you just need to be reminded of things to do. Congratulations on having the courage to start a business of your own and all the best! For most businesses which want to grow, having a team is inevitable, if not crucial. Yes, we have all had bad experiences, staff can be lazy, steal and make mistakes, even spend their whole day on Facebook and get next to no work done. However, staff can be your greatest resource and can be amazing, helping grow your business with the same passion, enthusiasm and effort as yourself. This eBook will show you how to avoid the staff member from hell and have those valuable, hardworking and enthusiastic people. Practical and real life tips you can implement to alleviate your stress! Stress is a huge issue for business owners and individuals alike. Everyone has experienced levels of stress at some time, but gone unchecked it can cause you serious problems. 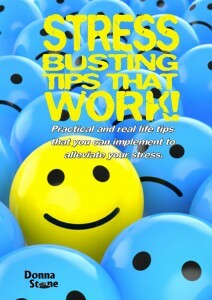 This e-book contains over 30 practical, real and easy to implement tips and ideas on how to successfully bust your stress. Once these strategies are implemented your stress levels are sure to drop, leaving you healthy and happy in your work or business, and life. 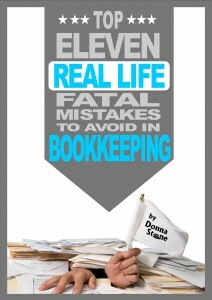 As a bookkeeper of almost three decades I have truly seen the good, bad and ugly of bookkeeping. 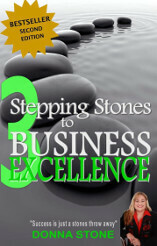 Some things I have seen are just shocking and it’s no wonder that 5% of business failures are due to poor bookkeeping. The things that I have pointed out are not from a text book or all theory; it’s from real life; what I see clients and bookkeepers do wrong the most – in real businesses. 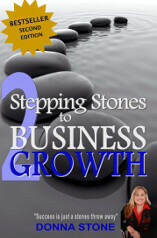 This e-book is for both Australian and New Zealand businesses. 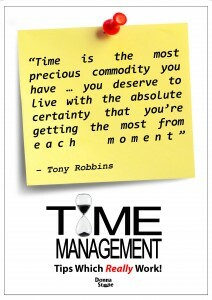 Time Management Tips which really Work! and true experiences with you. They worked for me and they can work for you! These tips are perfect for the small business owner, manager or career minded person who wants to really get somewhere – in the best possible time. Whether you’re just ‘doing it a bit tough’ or really struggling big time, or know you are trading insolvent, then this ebook is for you! So often failing business owners just go about things in the wrong way and make their situation worse. 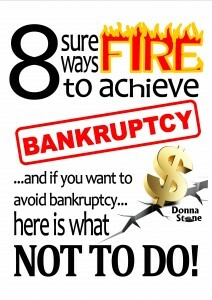 If you want to avoid bankruptcy, then take action today! Sadly less than half of small Australian businesses have KPI’s – and in fact a good proportion of us don’t even know what they are. 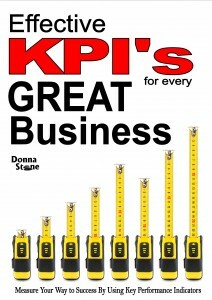 This ebook will explain what a Key Performance Indicator (KPI) is, why you need it and provide really practical guidance and tips on how to implement them in your business. This is written in clear to understand non-techno lingo that is a must for any small business out there who wants their business to not only survive, but thrive! Failing in business can be far more serious than a bruised ego; it could mean losing your home, credibility or heaps of money. 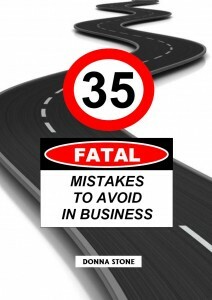 Wouldn’t it be great up front to know 35 fatal mistakes to avoid? Knowing what to avoid puts you on the road to success! Available in an iPhone and iPad friendly format. Networking can generate a heap of business; in fact in my business it’s responsible for 89% of my new leads, but so often it’s not done right. 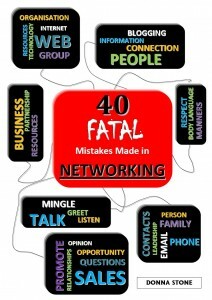 Some of us in business just don’t know how to get the most from their networking and how to do it well – so here are 40 fatal mistakes to avoid in networking. Do it right and it will absolutely help in the success of your business. This book is designed for all age groups. We get jobs for many reasons. It might be for experience, or to get into a field, or simply to earn a wage and have some money. 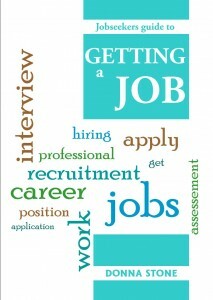 But whatever your reason for going into the workforce it’s always good to know how to get the job you want and then how to keep it and this is where the “Job Seekers Guide to Getting a Job” will come in very handy with all the great tips you will need to be successful in finding your dream job. 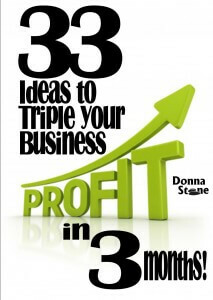 Here are 33 practical and real tips to get your business growing. Implement one, half or all these tips and you’ll definitely see a level of growth, everything from a few percentage to tripling your profit. 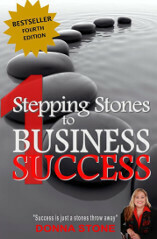 The author has been working with businesses for nearly 3 decades and grown her own successful business from 1 staff member to 16. Business success doesn’t have to be a secret for the lucky few! It’s not only large faceless corporations that experience theft and fraud – every business can. Prevention doesn’t have to be complicated, expensive or time consuming – it just requires some thought and pro-active attention to your business. 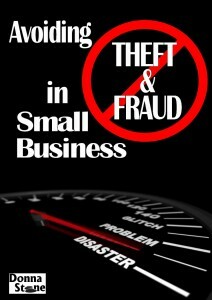 This ebook will cover everything to not only avoid theft and fraud in your business, but also how to detect it. 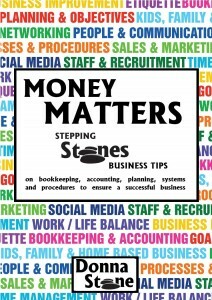 MONEY MATTERS: An excerpt taken directly from Donna Stone’s first book ‘Stepping Stones to Business Success’ which has been given rave reviews. This eBook includes tips on bookkeeping, accounting, planning, systems and procedures to ensure a successful business. 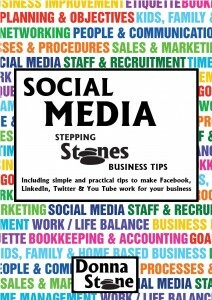 SOCIAL MEDIA: An excerpt taken directly from Donna Stone’s first book ‘Stepping Stones to Business Success’ which has been given rave reviews – including simple and practical tips to make Facebook, Linkedin, Twitter and YouTube work for your business. When is the best time to start your social media program? Yesterday. However the next best time is NOW. this eBook by social media guru Julie Mason will help guide businesses to build an engaging and profitable presence via social media that will generate leads and profits for your business. SALES & MARKETING: An excerpt taken directly from Donna Stone’s first book ‘Stepping Stones to Business Success’ which has been given rave reviews – including business improvement, networking and real life sales and marketing tips which get great results! Everything the small business owner needs to know about marketing their business, getting leads and then converting those leads into sales – over and over again. Networking can of course play a huge role in this process, learn all the inside tips from the twice awarded ‘Networker of the Year’ (2010 and 2011). 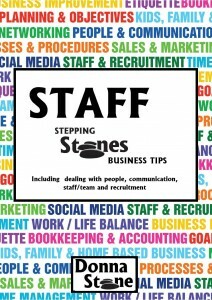 STAFF: An excerpt taken directly from Donna Stone’s first book ‘Stepping Stones to Business Success’ which has been given rave reviews – including dealing with people, communication, staff/team and recruitment. This eBook is just the thing for the business owner who wants to make having staff not just a pleasure, but a fiscal success. 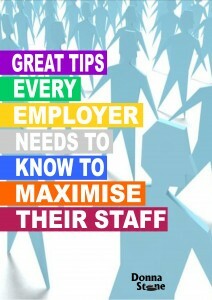 Lose the pains of employment, staff and team using real life and simple tips – it’s all in the know-how. 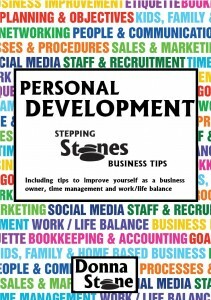 PERSONAL DEVELOPMENT: An excerpt taken directly from Donna Stone’s first book ‘Stepping Stones to Business Success’ which has been given rave reviews – including tips to improve yourself as a business owner, time management and work/life balance. Whether we are in a career, job, corporate position, or running our own business, it is important that we are constantly improving our business skills. This section is specifically geared towards owners of small businesses and what I beliefve you should be actioning to be the best you can possibly be!